This satisfies the some of the requirements for common core HSN.RN.A.1. 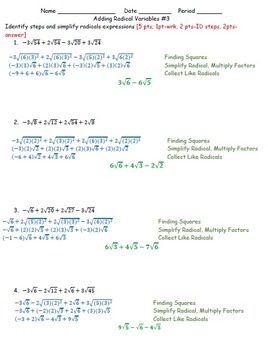 The purpose of this assignment is to reinforce the concept of simplifying and adding radicals. 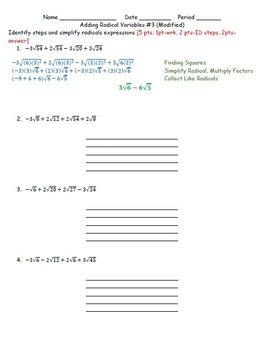 This worksheet is an additional assignment to “Adding Radicals #1 & 2” to give students more practice. 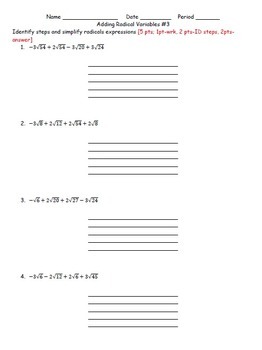 The main variation on this worksheet is that the students must write down the steps used to solve the problem; students might write add/subtraction instead of collect like radicals. 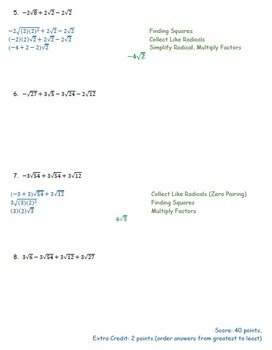 I also included extra credit if students put all of the final answers in greatest to least order (problem 6 is fun). This worksheet is two pages in length, but there are a modified set, limited answer key and answer key for a total of eight pages. Prerequisite for students to know is the basic squares of commonly use values, and integer rules. Pages 1 and 2 are for the general students. Pages 3 and 4 modified to help students complete this assignment. The limited answer key is for students to check their work and answers, it only has the odd numbers completed. I am using parenthesis to show multiplication, because it can be confusing for students with messy penmanship when working with decimals. If you find errors regardless how small please e-mail so I can make corrections. Thank You!